Two posts in 1 day?! I know, right?! This time I wanted to tell you about a wonderful opportunity of a gift to give your mom. The quantity is limited, so you need to hurry since these went on sale on March 25th. What is it? Just the best ever Mother’s Day Gift Set! THE COST IS EQUIVALENT TO BUYING JUST 3 WRAPS. 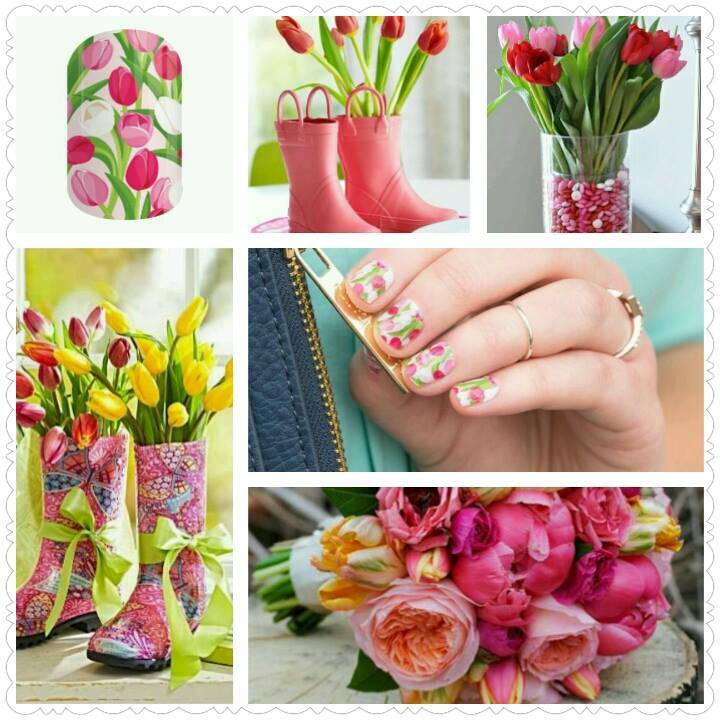 Want to try Jamberry? Complete the form and I’ll send you a sample. 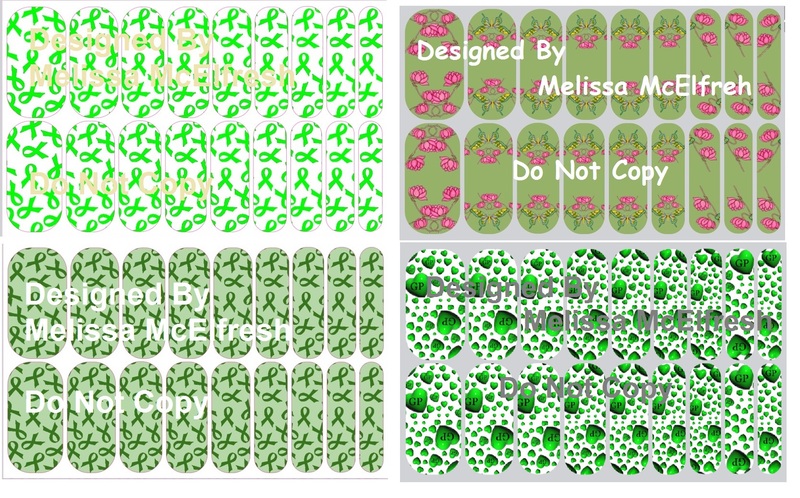 Wear GP Awareness on your nails and have a (optional) portion of the proceeds go towards GP Research (through IFFGD.org). This opportunity will be available until April 11, 2015. 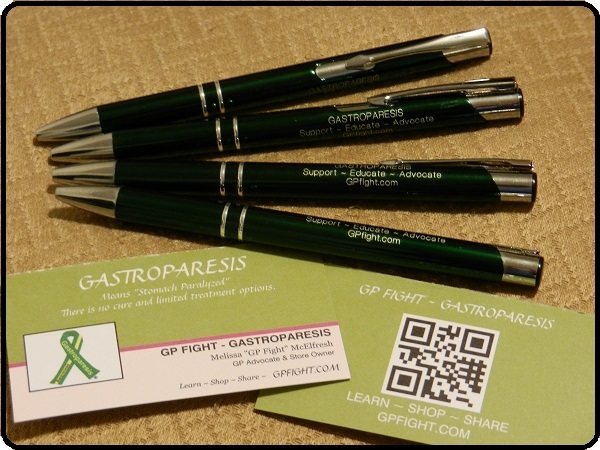 Thank you for supporting Gastroparesis Awareness! Did you read the exciting news I posted on new job adventure? Click HERE. It’s been 2 months that I have been with Jamberry and haven’t been happier for the decision. What is Jamberry? 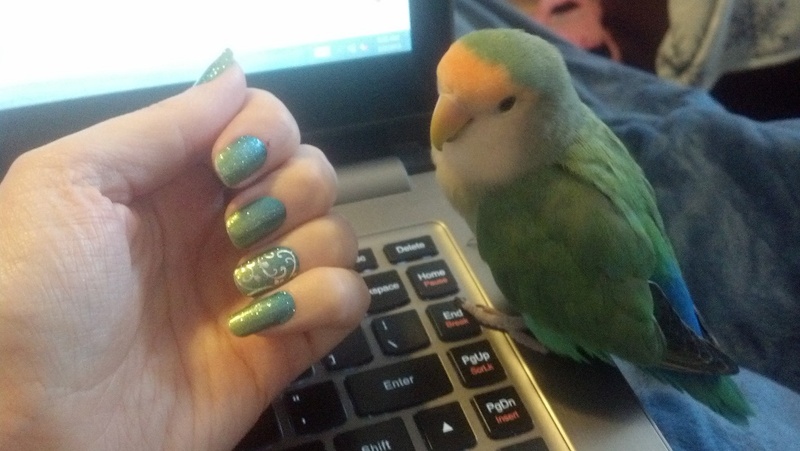 How about the best nail wraps for your fingers and toes ever invented! These last longer than the average store bought one and go much further for the value. On average the wraps will last 2 weeks on your fingers and over 4 weeks on your toes. 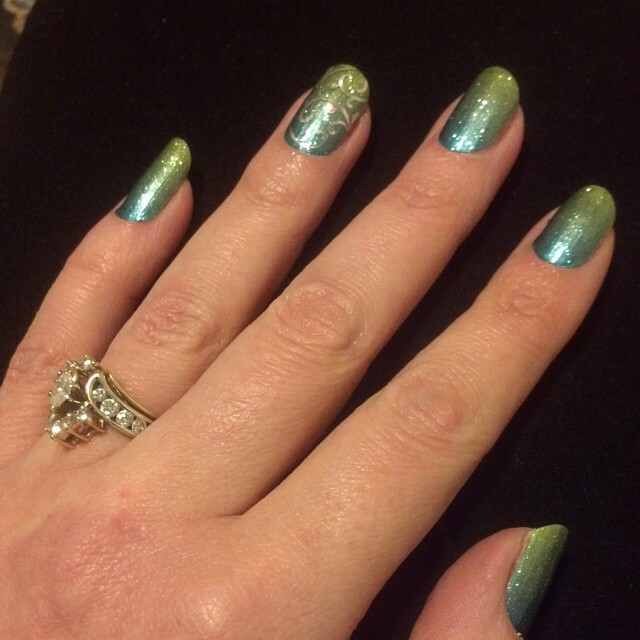 Personally, I have given up at 28 days on my fingers — the wraps were still looking great, but I wanted to change them. As far as my toes, I have had a set of wraps on for over 90 days! This was during the winter, lots of socks, boots, slippers and harsh temps; the wraps are still going strong but I am ready for a change — to Spring! 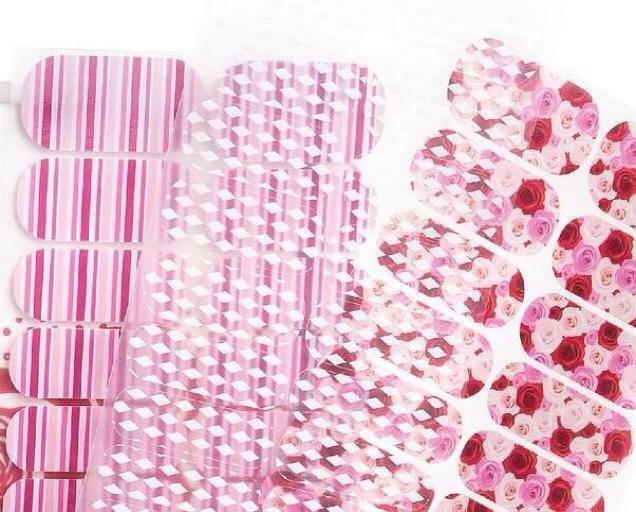 There are over 300 nail wraps to choose from, even nail lacquer and other hand products. Besides how long the wraps last, I have liked them since my nails break easily and these act like a protective layer. I never thought I would have long nails again! 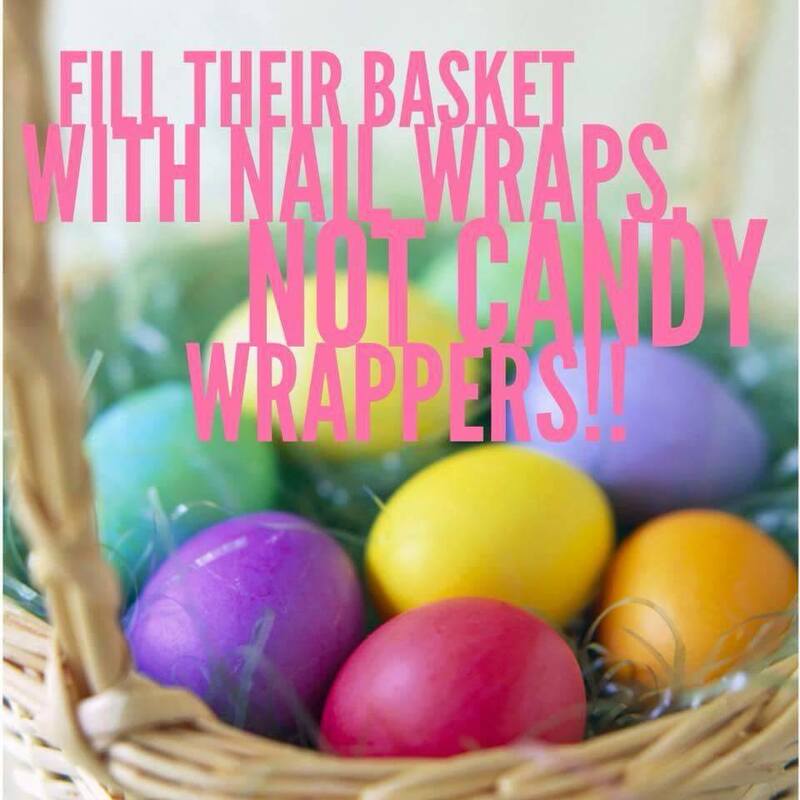 I invite you to try a nail wrap sample (click HERE). Even more so, I invite you to host a PARTY with me. This can be on Facebook or I can send you some catalogs so you can share this great product with others! Connect with me on my website to shop, plan a party or join my team. YES, you can sell these too AND make great money at it! How would you spend the EXTRA income? Buy something for yourself? Your kids or grand kids? Make a car or mortgage payment? For me it started out as saving up for a printer and new phone, but has turned into being able to make car payments for 1/2 a year. In just 2 months I have managed to do this and with only a couple parties on Facebook; which take only a few hours. Won’t you join me?? My New Work At Home Adventure …. want to join me? I am so very thankful that I have found something that I can do and it brings in more income then expected. As a reminder, I have gastroparesis and have found that even working 2 days at the local hotel was so much stress, I was sick more than I was ‘well’. So, I needed something I could do from home and have found it!! 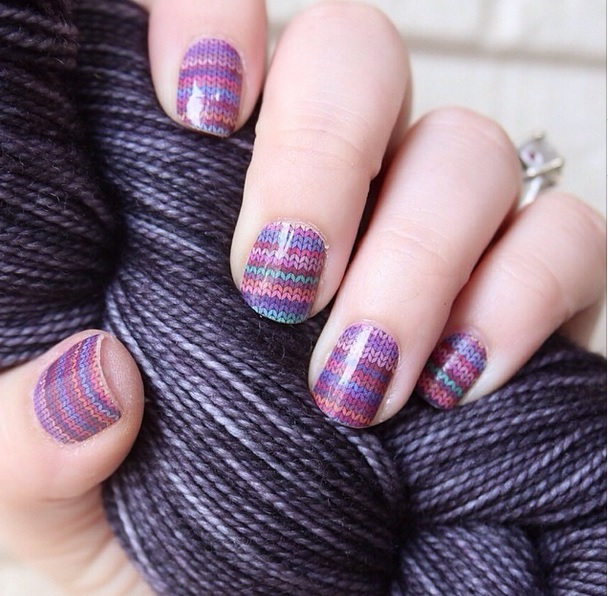 Have you ever tried the Jamberry Nail wraps? They started their foothold in the market about 4 years ago. 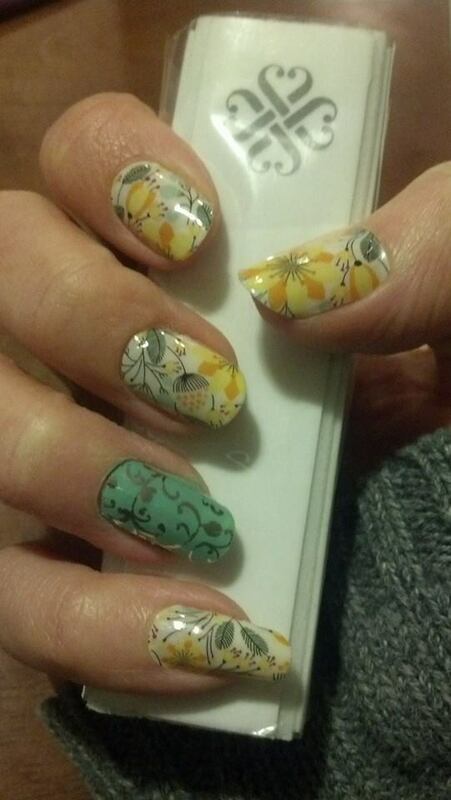 The nail wraps are different than what you see in the stores. These are applied with heat and last 2 weeks with heavy use. I have had mine on for over 3 weeks before I gave up and applied a different style (the nail grow out bugged me, yet not too many people in my daily life noticed it). On toes they last well over a month. I have had this same set of wraps on (my first pedi) since December (this post is late-Feb). 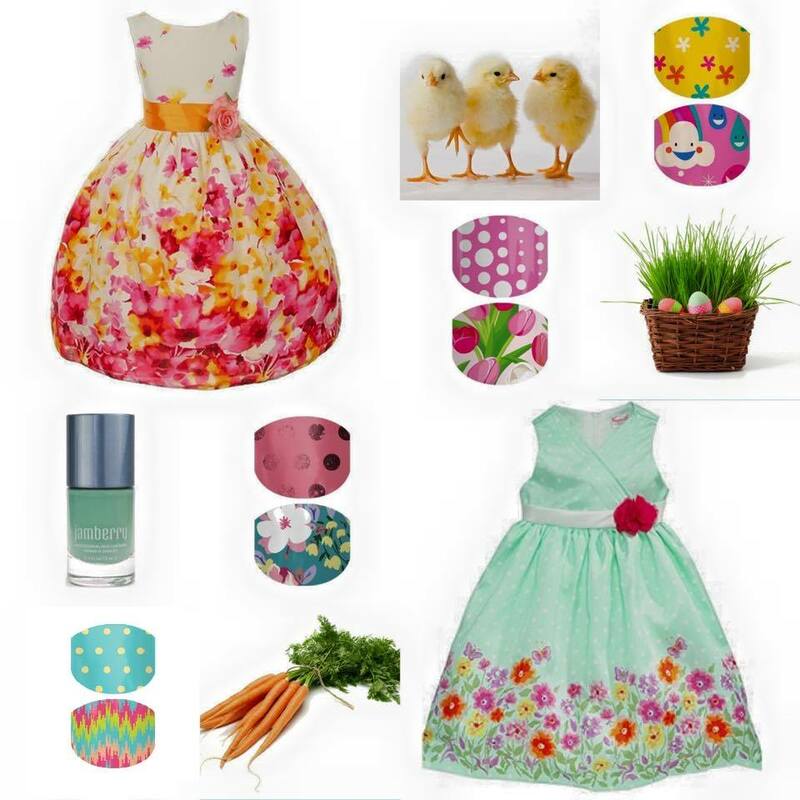 There are over 300 designs to choose from as well as nail lacquer and other products. Kids can even get in on the fun as well! The initial cost for the consultant kit was what held me back. 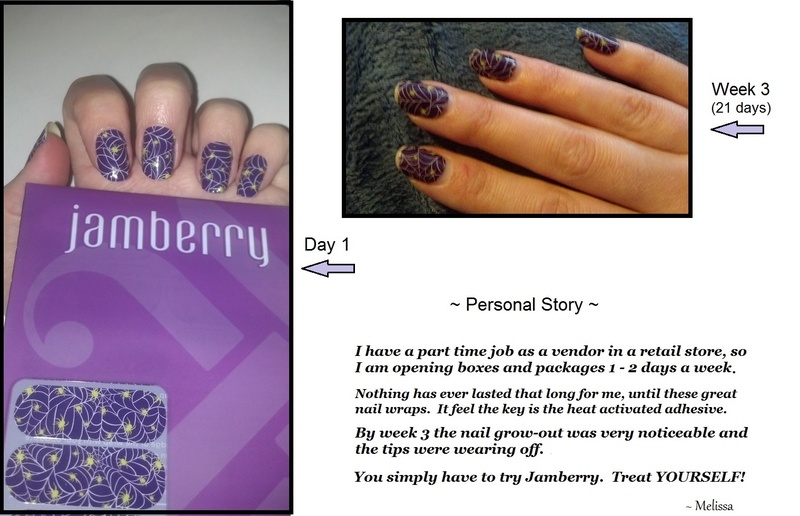 In hind-site, I wished I would have joined the Jamberry team sooner! My first party on facebook paid for my kit with the commissions I made, and a little extra. Since I started in mid-January I have done 3 parties and will host another on the 28th. What is great about this is we don’t have to build a team if we don’t want to. You can be what is called a Hobbyist and you will still receive the discounts on product and commissions if you do an occasional party. I have decided to build a team and am looking for great people to join me in my adventure. The commissions are among the best in the direct sales world, coming in at a minimum of 30% and it goes up from there based on your monthly sales and even more when you start to earn off of your team members. Then there are extra bonuses and incentives along the way. Currently we are earning our way to Maui as the 2015 incentive trip. In 2014 it was Walt Disney World! All expenses paid and includes funds towards air fair. Now how many companies do you know treat their employees that great?! If you would like to host a party, not yet ready to join my team, let me know. 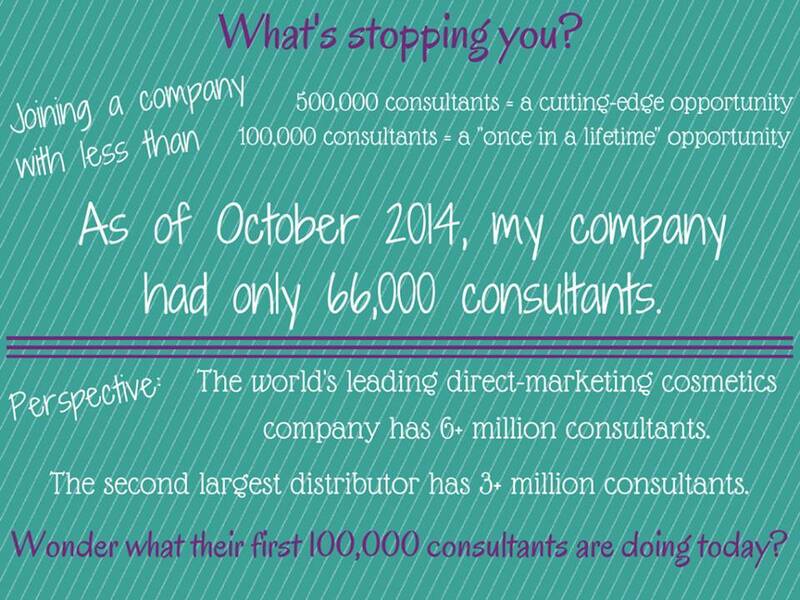 If sales reach a certain amount you can take 25% – 50% off the consultant kit. I am able to do FB Parties and Catalog Parties. 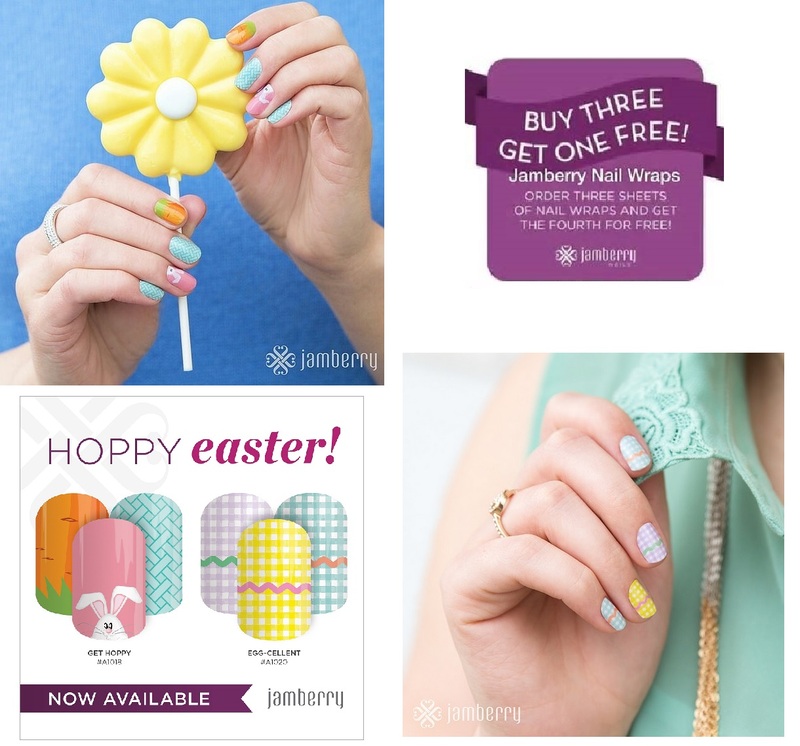 Shop the website and there if more info on joining my team too: www.MyBerryComplete.JamberryNails.net (the link is safe). I hope you decide to take advantage of this great opportunity. The market is not yet saturated with the product, so NOW is a great time to do this for yourself. Earn extra income while having great looking nails. What could be better?! First, let’s see how I did when I posted “2014 What I Want To See Happen”…. I’ll spare you on the details of the second part of my 2014 plan. For the most part I did about 70% of the personal well being goals. Not great, but there is always 2015! Now for what I want to see happen in 2015 …. Less Facebook (eekkk … did I just type that) so that I can focus a little more on ‘me’ and actually helping others. More blogging (medical advancements, personal and researched topics). More getaways with hubby. He has so much on his plate at work, it would be good for both of us to get away from home a little more. Still work on the pro/con food list of what works and doesn’t. Start up another vendor or work from home job. Work harder at daily house cleaning chores (yes, I have dust bunnies). Craft more cards. Such a relaxing hobby! Try to not stress so much about the future, so maybe my head will shut off at night and I can fall asleep. Find a good health care team — it’s about time for that. At some point in 2015 we will be moving – unknown when – unknown where. So, I need to focus more on ‘me’ to prevent a GP relapse. Things health wise have been okay and I want to keep it that way! Wishing you all a wonderful 2015. Did you get your 2015 “GP Faces” Calendar? As of this post we have 10 calendars left … so you’d better hurry if you still want one! For sale at The GP Fight Store via www.GPfight.com (Store tab ~ Shop Now). 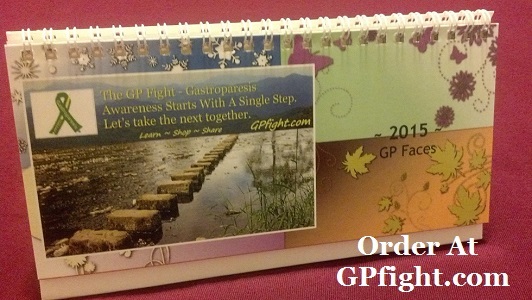 Each month has a picture of a person with Gastroparesis as well as a couple group photos. We’ve added a few important GP Advocacy dates too. 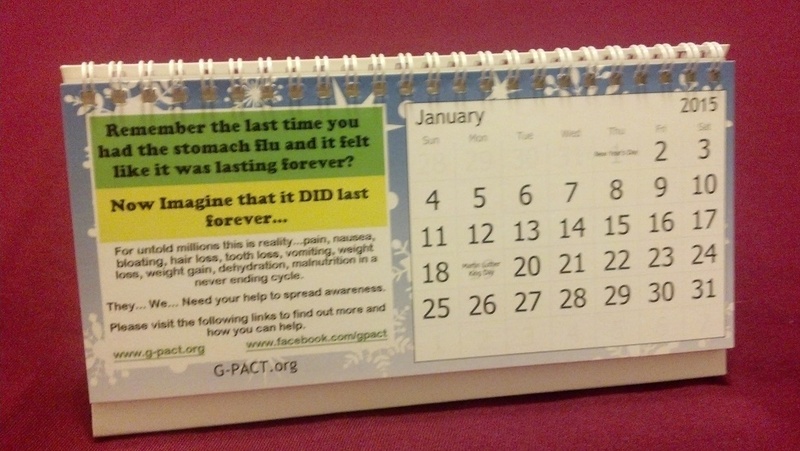 There are websites listed throughout the calendar to help others learn about gastroparesis and to connect to support groups and other helpful links. 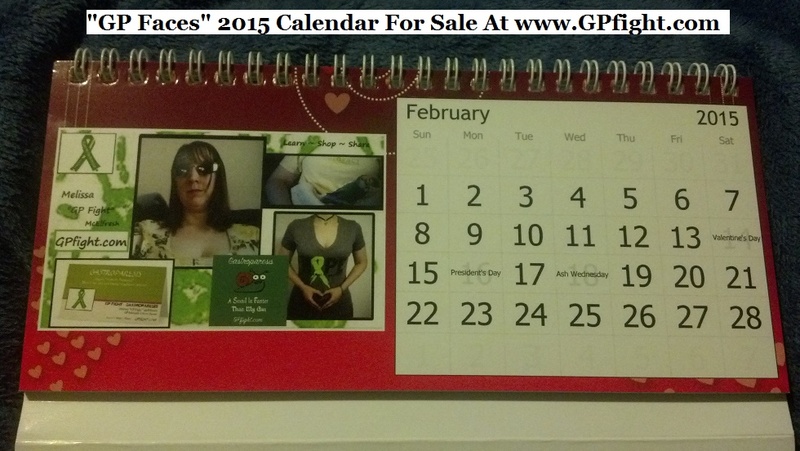 Calendar is $7 with $1 of that going to Gastroparesis Awareness. Shipping is extra. While your in there, check out our popular GP Awareness Cards that are for sale in 2 styles. With each calendar order G-PACT has given us some brochures, restaurant, venue/bathroom cards to also enclose. These calendars are the stand up desk ones (about 4″ tall and 8″ long). Perfect if you want to send it as a gift to a friend or co-worker! Thank you in advance for helping spread more gastroparesis awareness!